I told Donovan this week, If we don't go on a date this weekend...you will need to commit me into a mental institution. It was one of those weeks. I needed one on one, with my hubby. I needed uninterrupted conversation. I needed to remember why we got got married in the first place. We've been so caught up in the day to day. The laundry, the cooking, the cleaning, packing lunches, groceries. You know how it is, I know. We haven't been on a date in a very long time...And I desperately needed to be with my husband, to be taken out of the role of mama. I know you know, Right? And I really wanted to see the new movie that came out on Friday, FIREPROOF. I'm sure you've heard all the hype on Fireproof. Let me promise you that all the excitement is for a very good reason. It is the best movie ticket you will ever buy. I hardly ever cry at movies. Donovan never does. We both cried, it was moving. It was drama, it was romance, and even a little action. It was clean. A clean movie, with morals - what a concept. What an eye-opener to where your marriage can go when you don't put your spouse 1st before others, and things in a marriage. It is so easy for me to let everything crowd out my relationship with Donovan. There are so many things to do that are good things to do. And most of those are family related things we do. But if you don't take time to connect with your husband/wife, you are putting yourself at risk. I have done that. I don't take time to really be with Donovan. We are together a lot. We are with the kids a lot, that is our season of life. But to be engaged in one on one time with each other is far and few between. It's so easy for me to let all the other things consume me or to get so caught up in this place we are with our 4 kids. It's so hard for me to say no to others. It's so hard to fight for time for just Donovan and I. But oh, when we do, I am better for it always! 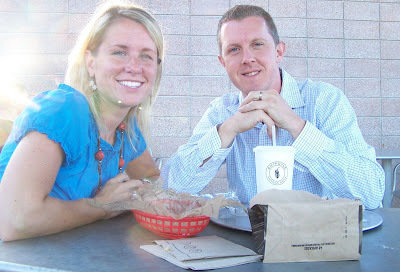 So Saturday night we went for a shared chicken burrito at Chipotle, and then went to the movie. It was such a great reminder to make time for each other. We talked all the way home on ways that we need to work harder at our marriage, and not let this season of life force us to put our marriage on the back burner. 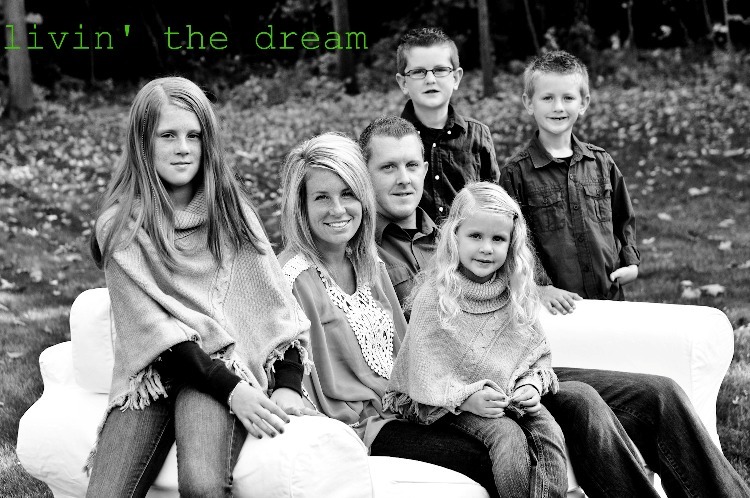 I Do NOT want to get to Suzy's graduation and not even know my own husbands dreams, and passions in life. And then finally take the time to work at strengthening our marriage when the kids are all grown up. What a great reminder that our marriage is not Fireproof....it needs to worked on so that when the fire comes....we stay committed to each other and our promise to God. I have not arrived. I am work in progress. This is one of the many areas in my life I'm still working on. A huge thanks to Donovan's brother Jon and his wife Arlene for braving our 4 kids in addition to their newborn, so that we could enjoy this night out at the movies. So I'm off my soapbox for now...but please go and see the movie. It is awesome!! In other news....We got to go to the MCC Relief Sale again this year. Not before taking a loan out at the bank on the way there....because is it just me, or did everything get more expensive? Or is it just that my kids eat SO MUCH?? I know, I know...it's a good cause, you're right. 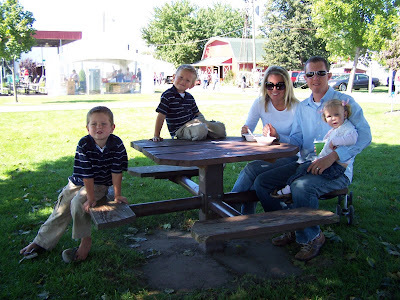 And the homemade ice cream was totally worth it....we are enjoying some in the picture here. And that brings me to tonight's festivities....We were in the ol' stompin' grounds again. Sigh from all the faithful readers I know. A friend of mine from Sturgis had an open house celebrating the new home they moved into. 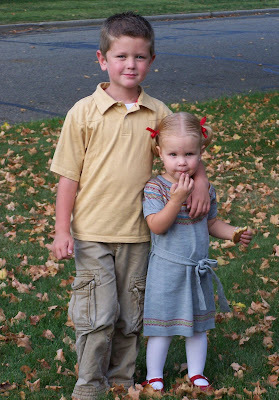 Any of you that have known me for the past 10 years or so will remember 2 little girls that I spent a lot of time with. Nicholette & Dannette. Before I was married I worked with their mom, Nann. She is pictured above. And her and her husband were also involved with Amway. They needed a babysitter on a weekly basis in the evenings so that they could be at functions. That's where I came in. Nann was even sweet enough to feed me and let me do my laundry at her house, while babysitting. It was a sweet deal for us both. I absolutely fell in love with these girls. I often wish I could've kept them for my own. Esp. after I got married. 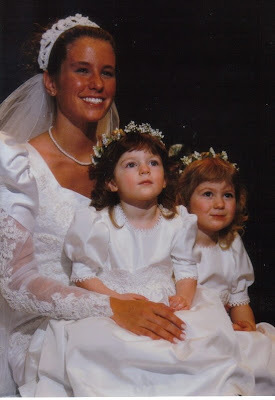 We had them in our wedding, as flower girls, I kept thinking it would be fun to keep these little sweeties for our own. 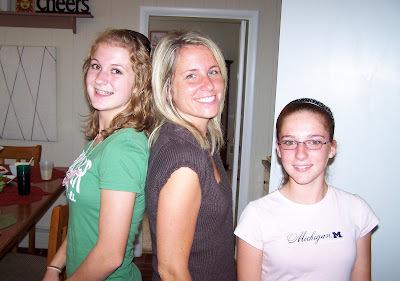 Yes, Nicholette is taller then I am, absolutely amazing! 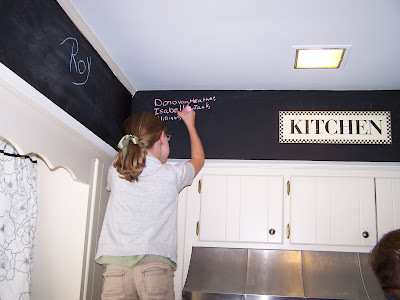 In Nann's new kitchen she tried several different colors of paints on her kitchen soffit.... until she finally had a suggestion from one of her daughters to use chalkboard paint. So how cool! 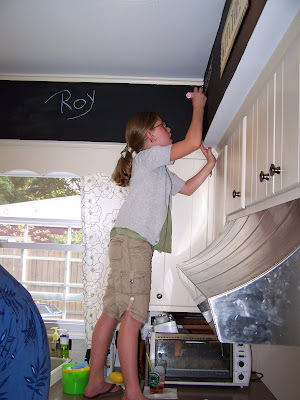 All her guests signed her kitchen. It's so fun to be with friends when time does not diminish any part of your friendship. This was a picture I snapped just before we left tonight....looking like fall, isn't it??? William: "Mom, I said, if I didn't cry I wasn't going to have to take a nap." Me: "William, YOU are not the boss." William: "How about you, daddy, and me can be in charge?" How awesome that you and your hubby were able to go out! I too have been feeling that my whole existance in life is for my kids and the housework, now on top of that I've added a part-time job. I have tears rolling down right now because I long to re-connect with Matt, to find out who we are now, who we were and where we want to go. I just don't even know how. You have given me some incentive to at least give it a whorl. THANKS!! God Bless you and your ramblings! Great post Heather! I agree that we HAVE to take time with our spouses. In this season of life especially! Thanks for the reminder. Glad you got out to see a movie and had some good together time! Wow! Love the blog! Of course I always love & enjoy reading all of them, but wow how deep! You are seriously my hero sister! You have it goin' on and all together in every aspect of your life for you & your family! YOU ROCK! I always have looked up to you for that! Thanks for the awesome blog you created! ps. Thanks for your comments on my other blog! I didn't see them until this morning. I am ready to get back on track, thanks for letting me know I am not alone! We REALLY need to get together sometime!!! 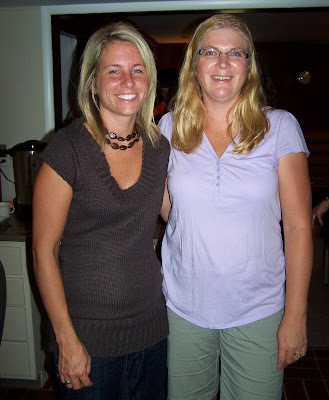 You are such a great blog-friend! I'm so glad you and Donovan had a chance to see the movie...I knew you would love it as much as I did! You made a lot of excellent points about our relationship with our spouse...how very important it is to never stop working on our relationship! Thanks for the encouragement and challenge! heya! we finally made plans to go watch the movie. i can't wait!! Our church has been urging all couples to go and see this movie...I've also heard it's really good!! SO glad you got a "date night"...Matt and I actually got one this weekend too!! "my ankles are making my stomach hurt."